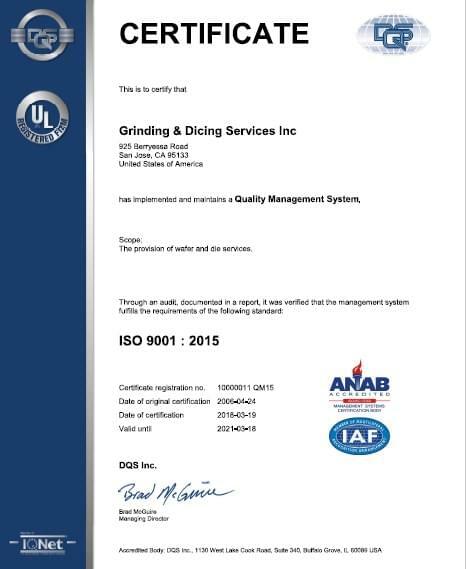 When you work with Grinding & Dicing Services, Inc., you know you’re working with the best. GDSI WaferGrind.com is widely recognized as the industry authority for complex wafer thinning and dicing activity. Based in the Silicon Valley for over 25 years, we have refined our understanding of how different materials react to specific process conditions. We are the first bona fide, non-captive supplier to offer Stealth as a service in the USA. Until now, this service was only available overseas through large foundries, OSATs and IDMs. Now, our goal is to bring leading-edge Stealth dicing technology to the public in support of NPI and mid-volume production activities. Our facility is secure and well-maintained, ensuring that our clients will not have their confidentiality violated. We are also ISO & ITAR registered, approaching each opportunity in a methodical fashion. GDSI carries a “Trusted Supplier” accreditation with the USA DoD, requiring the utmost discipline for material handling. Click below to view our facility. Contact us today to learn more about our MEMS dicing qualifications. We are based in San Jose, CA, and work with clients worldwide.